I'm not very good at art and graphics, would this be a problem? My artistic talents are purely musical. From the drawing point of view, I haven't progressed beyond 'stick men', consequently all of my sign designs are simple and in the main symmetrical, but to be honest, that's what most people seem to want. If you are more creative, you could do wonders! Do I need to be a computer whiz to do this? No. I'm no computer whiz and I managed it ok. I even created my own websites which you can copy easily if you wish. When first setting up a plotter to your computer, you will probably have a few hair pulling moments, but this will probably be due to an incompatible baud rate or comm settings (remember this!). But reading the instruction guide that comes with the cutter should solve all the problems. I'm 60+. Am I too old? I used to think I was too old when I was 20. Now that I'm 68 it worries me less. You're never too old. In fact learning something new is good for your marbles! If I don't understand something can I contact you? Yes. The information has been written by me the seller and I will be happy to answer your questions by email. In fact the guide has evolved as a result of people contacting me. Is this just the start of some long ongoing money extracting process that's going to cost me a fortune? NO. There are no ongoing extras that I will try and sell you other than some low cost graphics that you can see on my website (but I won’t bug you). The price you pay me is the total and really is a good deal. Obviously you will need a cutter and materials, but I am not in cahoots with anyone selling this stuff so my recommendations are based on totally impartial and I assure you that I receive no commissions from anyone. You claim that this business can be started with just £500 capital. Isn't this a bit optimistic? No I'm not lying. 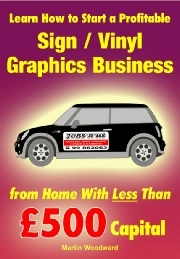 You can obtain everything you need to get started for less than £500 and this includes a vinyl cutter and materials. Isn't it a bad time to start a business, with the recession being on? I've lived through 3 serious recessions. It's a cycle, they begin, they end, and the new businesses that emerge when they end ALL NEED SIGNS. And if you operate from home and keep your overheads low as I recom+mend YOU WILL SURVIVE as I have done for the last goodness knows how long. So how much room will I need and isn't it too messy to run from home? I've run quite a large operation from a spare bedroom. I have to admit, it did spread out a bit into other rooms and every now and again the wife threw a fit, but if you are organised it can be run from one room easily. Vinyl cutting is not messy or dirty at all. Don't compare it to screen printing or digi printing which ARE messy and really would need at least a garage. What about competition, surely everyone's at it? A lot of people are at it because it's a good profitable business, but YOU can have the competitive edge if you remain a sole trader working from home and especially if you specialise with certain businesses. But hasn't it reached saturation point? Look around you - signs are literally everywhere: inside/outside shops, offices, cars, vans, windows, street signs, house signs, vehicle graphics etc, etc. They're even in the sky on the planes, in churches, zoos, schools and hospitals etc. I doubt if you could walk 10 feet without seeing one. And someone is making money out of all of them! Wouldn't it be safer to buy into a franchise? Basically franchises are a suckers game! So why can't I buy an instant download? This item is available as physical paperback book or download. If you buy the paperback version from lulu.com , let me know the sale details and I’ll send you the download version as well, which is useful for the websites and hyperlinks.